Just a sophomore, Horak (5-9, 175) has been the primary driver of a Rossville offense that is averaging more than 40 points per game. Horak is the Bulldogs’ leading rusher with 758 yards and 15 touchdowns while averaging nearly eight yards per carry. He has completed 64 percent of his passes for 943 yards and eight scores. 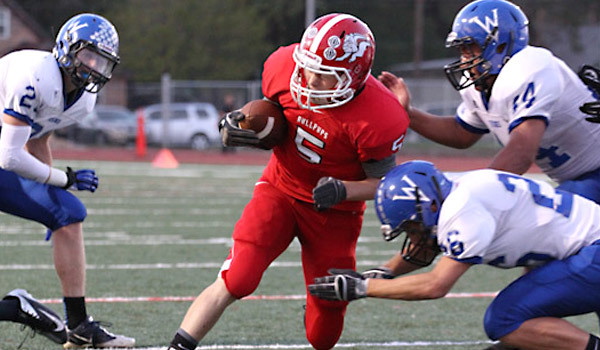 Horak should have another big offensive night on Friday as Rossville hosts Mission Valley to open district play. Prior to last week's win against Mulvane, the Bullpups had serious concerns on both sides of the ball. They had lost back-to-back games in which they allowed at least 28 points and scored no more than 17, but with one half of football McPherson was able to re-establish themselves as a scoring machine that can find an answer on defense when needed. The bulk of that offense goes through junior quarterback Kyler Kinnamon, who rushed for a whopping 225 yards and 3 touchdowns on only 12 attempts against the Wildcats. While the Bullpups will be tested this week against undefeated county rival Smoky Valley, Kinnamon's a gamer and will lead the way for the Bullpup offense. Mason, a 6-1 200 pound senior, has rushed for more than 170 yards in each of his six games this season for the Wildcats (3-3). On the season, he has 1,358 yards on 164 carries (8.28 yards per carry) with 17 rushing touchdowns. Mason, who lifted 26 reps on 185-pound bench at the Shrine Bowl Combine this summer, has four games this season with over 200 rushing yards. Look for the yards to keep coming for him this Friday against Winfield in the opening round of district play. The senior linebacker and Illinois-commit has been the leader of the Tigers defense all season. He makes tackles behind the line and helped to keep St. Thomas Aquinas to just three points last week. Blue Valley will need another strong performance out of McGrew (6-3, 235) as it takes on Blue Valley Southwest in the first game of district play. Tebo is a three-year starter on the offensive and defensive lines for the Railroaders. Also a three-time all-state golfer, the 6-foot-2, 225-pound Tebo leads the 2-4 Railers with 46 tackles - it's rare for a defensive lineman to pace his team in tackles. Tebo also has a tackle for loss, a sack, pass defended and a blocked field goal. In his career, Tebo has played in 26 games with 104 tackles and seven sacks. Tebo already has 12 more tackles this season than he has had in any year of his career. He and senior veteran linemen Nick Gehring and Brody Douglas will need to have big games in a key home district contest against a depleted St. Francis squad. Ware has been an extremely accurate passer in leading the Cardinals to a 5-1 record this season. The 6-0, 190-pound junior has completed 100 of 160 passes for 1,559 yards with 11 touchdowns and only three interceptions. Ware also has rushed for 397 yards and six touchdowns. In last week's 49-24 win over Moundridge, he had a season-best 338 passing yards with three touchdowns. Ware could have big numbers again this week at home against the 2-4 Wichita Independent Panthers.